Officer Russell L. Peterson joined the Las Vegas Metropolitan Police Department on April 17, 990. He served approximately six years in Patrol, Training and the Gang Unit before transferring to Search and Rescue in May of 1996. On the Afternoon of March 24, 1998, Officer Peterson and a volunteer were on a training exercise at Mt. Charleston. 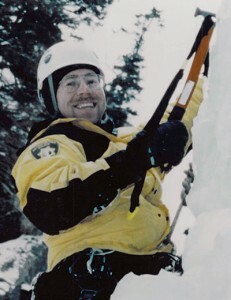 While Officer Peterson was belaying the volunteer on an ice climb on a frozen waterfall, a large piece of ice broke loose from high on the mountain. The ice narrowly missed the volunteer before hitting Officer Peterson, killing him instantly. Officer Peterson celebrated his 40th Birthday one day earlier. He is survived by his wife Lesa.